This year marks the fourth edition of Power to the Pixel which has grown over the last few years to become the leading voice in transmedia in Europe. This year promises to be bigger and better with an exciting lineup of projects, speakers and industry attending the three day event. WorkBook Project: What’s new at this year’s Power to the Pixel and for people who don’t know can you explain briefly the types of programs you offer? Liz Rosenthal: The key expansion of this year’s Cross-Media Forum is The Pixel Market – our new finance summit for international cross-media projects running over 13 & 14 October. We’ve selected 18 international cross-media projects whose stories span across film, TV, gaming mobile, publishing and real life events . We’ve set up one-to-one business meetings for the project teams with potential commissioners, financiers and partners. Nine of these projects have been selected to compete for the ARTE Pixel Pitch Prize £6k/ $10k (approx). The event runs 12-15 October. There are two open days. 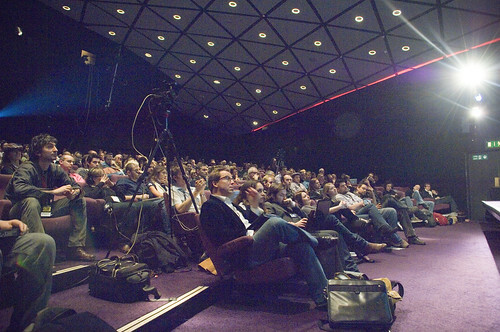 13 October is The Pixel Pitch Day at The National Film Theatre, BFI Southbank The Pixel Pitch is the public day of The Pixel Market and presents an ideal opportunity to discover first hand what types of projects are getting financed and by whom. Nine international producer-led teams have been chosen to present their projects to a select jury made up from international decision-makers, commissioners and executives from across film, advertising, broadcast, the arts, online and games. They will compete for the £6,000 ARTE Pixel Pitch cash prize. The Pixel Meetings take place on 14 October and this year’s Power to the Pixel Think Tank on 15 October is dedicated to finding the practical steps that will allow the film and media industries to grasp the opportunities of cross-media change. The results will be freely available in a Think Tank report to be produced by Power to the Pixel. WBP: What are some interesting projects that have caught your attention over the last year or so that you feel are good examples of transmedia projects? LR:There are a number of projects that we are showcasing at this year’s event. Three documentary projects illustrate how interactive platforms can enhance and transform the possibilities for documentary storytelling to interpret and synthesize many sources of information to explain a situation or express a POV. Collapsus is a brand-new transmedia project from SubmarineChannel, directed by Tommy Pallotta, producer of Scanner Darkly and Waking Life, and director of American Prince. It combines interactivity, animation, fiction and documentary and looks into the near future to show you how the imminent energy crisis affects a group of ten people, who appear to be caught up in an energy conspiracy. Collapsus is the transmedia project associated with the documentary, Energy Risk. Prison Valley is the latest interactive documentary produced by Upian and ARTE by by David Dufresne & Philippe Brault It investigates the prison industry in Fremont County, a remote part of Colorado, USA, in the French documentary. The two reporters explore an area that has 36,000 inhabitants, over 7,000 inmates and 13 jails. Prison Valley is made up of a linear 59-minute film, which was aired on television channel Arte (who co-produced the documentary) on 12 June, 2010. But besides this, web users can view extra footage, interviews and statistics online.The documentary uses many of the possibilities provided by the Internet, including photography, text, audio, video and infographics. Viewers can explore the content using a navigation system similar to a video game. 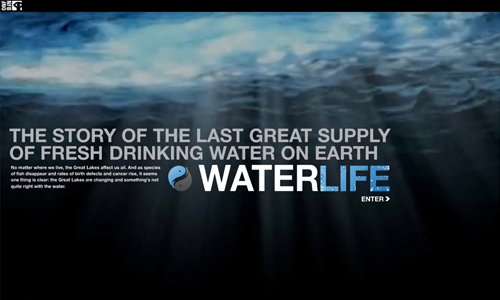 Waterlife is a stunning ode to the last great supply of fresh water on earth, the Great Lakes, as well as the award-winning full-length documentary feature directed by Kevin McMahon and produced by NFB Canada, the online interactive experience immerses us in their extraordinary beauty, ecological complexity, and extreme state of distress. 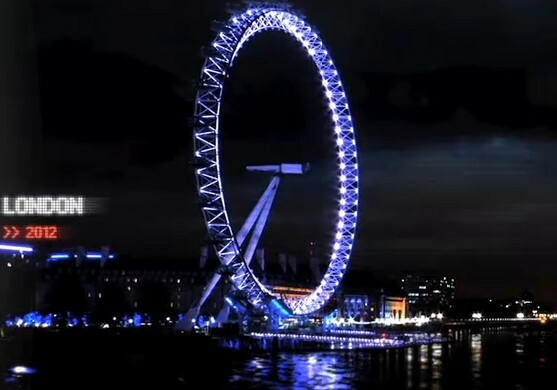 Another project that hit the headlines this was Conspiracy For Good an augmented reality drama that took place on the Internet, on mobile devices and offline in four live action events in London. It was developed by Heroes creator Tim Kring ﻿and sponsored by Nokia.﻿ The audience played the part of activists and supporters of the eponymous organisation, Conspiracy For Good, and joined in to help direct the action by solving various puzzles spread across different media. WBP: In terms of emerging trends what do you think is most interesting for those who are telling stories? LR: Evolving devices, software and applications are enabling a whole new Renaissance in storytelling possibilities. Film and TV storytelling until recently has been essentially confined to distribution formats and release windows. Now the possibilities of extending stories in a multitude of new ways across different media platforms and devices is huge. As well as the creative aspect there are powerful ways of engaging new audiences and increasing the discoverability of projects and also attracting a whole new pool of finance and media partners. The personalisation of media is also one of the biggest trends that is effecting storytelling. Audiences are frequently no longer passive consumers of story but active collaborators and stakeholders in terms of co-creation, marketing, distribution and sometimes even in terms of financing. WBP: What do you hope people will take away from this year’s event? LR: The projects above and new ones that we are showcasing at The Pixel Market demonstrate that filmmakers and storytellers of diverse formats and genres are embracing these new trends. Many of the stories that we have heard about in terms of cross-media or transmedia storytelling have been huge studio franchises and often been seen soley in terms of marketing not storytelling or in any form of increasing the value of the property itself. In a world where the value of traditional media formats is steeply declining and where audience behaviour is rapidly evolving, we are keen to demonstrate at Power to the Pixel that cross-media storytelling is an essential way for creators and media businesses to reach new audiences, extend the values of the properties they are developing and to find sustainable business models in a rapidly evolving media world. This entry was posted on Saturday, October 9th, 2010 at 7:08 am	and is filed under Comment & Analysis. You can follow any responses to this entry through the RSS 2.0 feed. You can leave a response, or trackback from your own site.